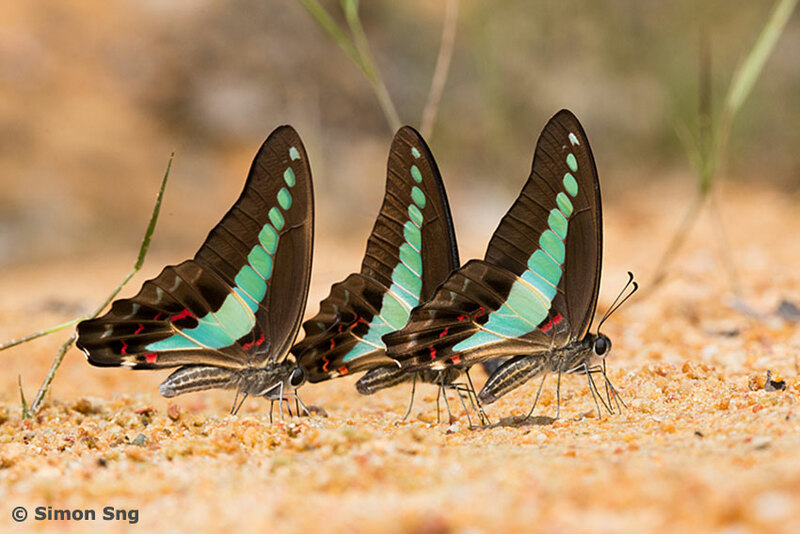 When butterfly season returns, particularly in Malaysia and Thailand, sandy riverbanks can be teeming with hundreds of puddling butterflies. When disturbed, the cloud of colour created by these flying jewels that leap into the air is absolutely breathtaking! In Singapore, such sights are rare, and on occasional instances, only up to a dozen puddling butterflies can be observed puddling together. This shot, taken last weekend by ButterflyCircle member Simon Sng, shows a trio of Common Bluebottles puddling on a sandy streambank within the nature reserves of Singapore. All lined up and puddling in unison, the Bluebottles are sipping critical nutrients from the moist sand. This fast-flying species are much easier to photograph when they are distracted whilst puddling.